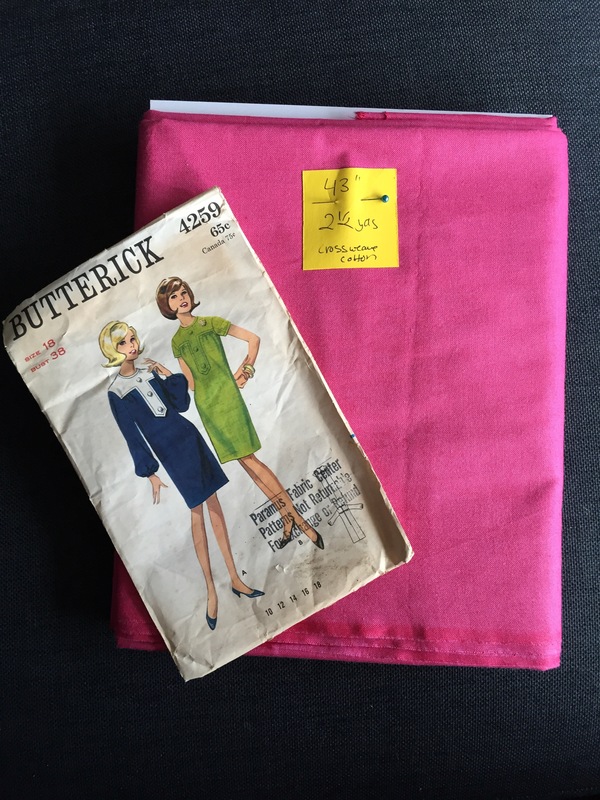 When Rochelle announced Spring for Cotton I knew it was finally time to sew one of my many vintage patterns! I have a huge stash courtesy of a family friend, but they are all single sized. Since they were also the wrong size, I was reluctant to try to make them but after taking my Palmer/Pletsch class I’m much more confident about fitting and grading! This was my original plan for the dress. I had picked up this gorgeous fuschia crossweave cotton at Josephine’s Dry Goods before the downtown location closed. It was only 43″ wide to begin with and after washing it shrunk down to under 40″ and so I didn’t have enough fabric. Boo hoo! The funny thing about the pattern is that it’s a Size 18, which is what I use but is sadly from the old sizing system so it still needed to be graded up. I was looking for a cotton with a little more body than just a quilting cotton and I didn’t want to shell out the money for something really nice until I knew if my grading was successful. 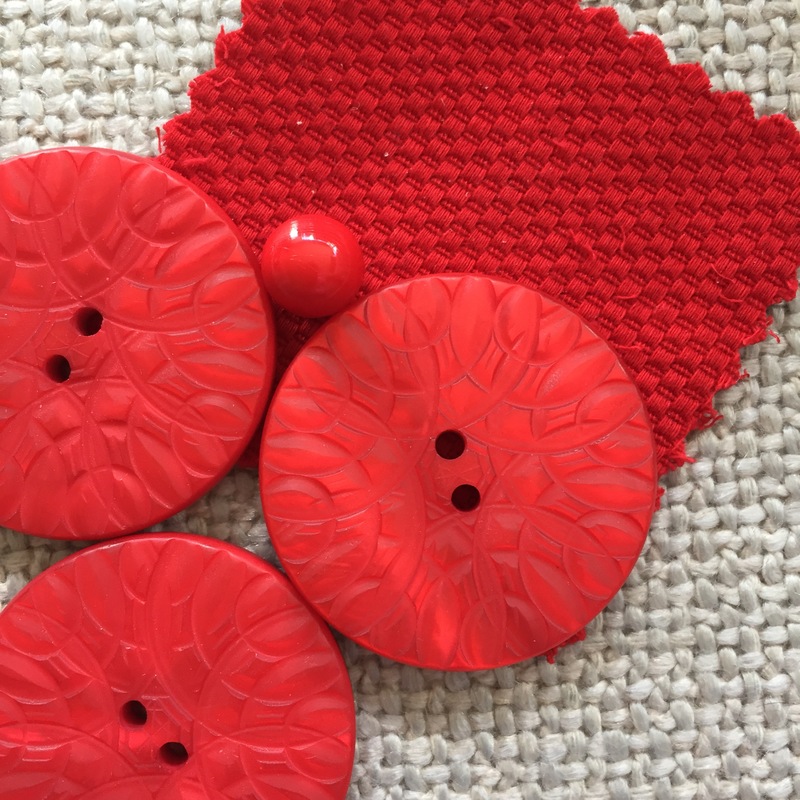 I ended up finding red cotton pique in the “Designer Fabric” section of Joann for just $5/yd. Score! The dress is constructed by first sewing the front and back plackets which are self lined. The dress pieces are then pinned along the stitching lines and top stitched together. Sleeves were added in the usual manner. For pattern modifications besides grading up a size. I did do an FBA on this dress. I didn’t like how dart looked so I moved the excess into the front gathers. This dress is insanely long,unhemmed it hit me at midcalf and I’m 5’7, so I didn’t worry about the uneven length created by the FBA. I also had to deepened the front neckline as it was nearly choking me. Ladies in the 60’s must have had very skinny necks! I also ended up edge stitching down the placket. The instructions don’t call for this, but it looked unfinished to me with the edges flopping around. So I did it and I like the way it looks much better. I also omitted the back zipper, leaving the yoke section open and adding a top hook. I’ve come to realize I can pull many of my dresses over my head and zippers are unnecessary. My favorite part of this dress must be the buttons. I went to the Button & Ribbon Emporium here in Portland to search for the perfect buttons. I pulled out tons red buttons before I came across these beauties. They are slightly translucent/iridescent and I love the swirly design on them. At nearly $3 each I spent almost as much on buttons as I did on my fabric but they were worth it! I will eventually take some photos of me wearing this dress, but I haven’t had any time. 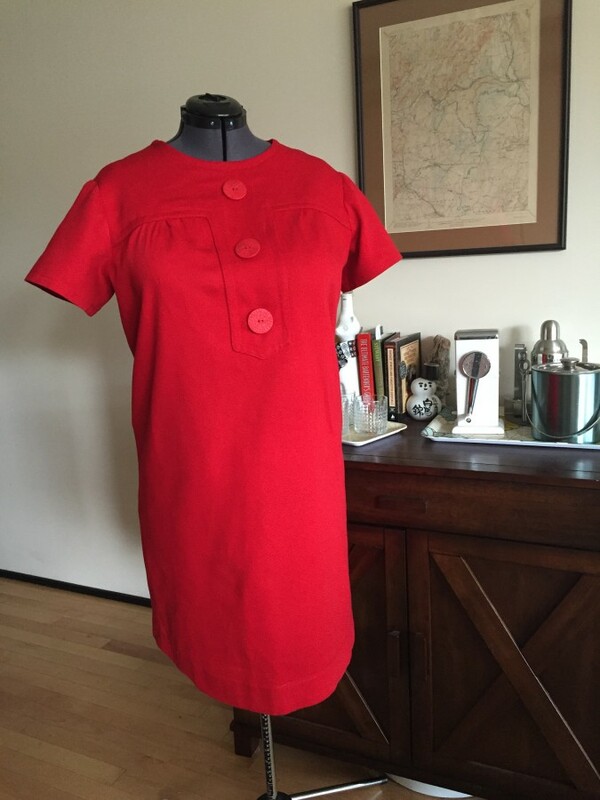 This dress is also my first project for the 2015 Vintage Pledge.